June 9 (Bloomberg) -- Investor Marc Faber said cash and bonds will be “very dangerous” in the next 10 years as governments increase money supply to cover fiscal deficits. “There’s no other way out but to print money,” Faber, the publisher of the Gloom, Boom & Doom report, said at a forum in Seoul today. “In the long run, all paper money will go exactly to its intrinsic value, which is zero.” Faber advised investors to protect themselves with assets such gold and silver. Bullion climbed to a record in euros, pounds and Swiss francs yesterday as investors sought to preserve their wealth against declining currencies. Risks to the global economic outlook have “risen significantly” and room for policymakers to support growth has become “much more limited and has, in some cases, been exhausted,” International Monetary Fund Deputy Managing Director Naoyuki Shinohara said in Singapore today. Total assets held by U.S. Federal Reserve banks rose to a record $2.35 trillion on May 19 as central bankers printed money to buy debt and rescue lenders as credit markets froze during the global financial crisis. The European Union last month pledged a 750 billion-euro ($900 billion) aid package to prevent a debt spiral that could spread from Greece to Spain and Italy. Bill Gross, who runs the world’s biggest mutual fund at Pacific Investment Management Co., says the best is over for bonds. Record budget deficits and sales of government debt will eventually spur inflation, drawing the almost three-decade bond market rally to a close, the Newport Beach, California-based firm’s co-chief investment officer, said in a March interview. Earlier this month, he said the U.S. is emerging as “the least dirty shirt” because it is drawing investors who are seeking safety during the European debt crisis. Spot gold has climbed 12 percent this year and silver has advanced 7 percent. At the same time, the euro has slumped 16 percent as the fiscal crisis made money managers wary that some debt-swamped nations might default, or even revert to old currencies. The MSCI World Index of stocks has slid 10 percent. Faber advised investors to buy U.S. stocks on March 9, 2009, when the S&P 500 reached its lowest level since 1996. The measure subsequently rallied as much as 70 percent. He also predicted in May 2005 that stocks would make little headway that year, with the S&P 500 gaining 3 percent. Faber was less prescient in March 2007, when he said the S&P 500 was more likely to fall than rise because the threats of faster inflation and slower growth persisted. The S&P 500 climbed 10 percent between then and its record of 1,565.15 seven months later. Granted, sovereign debtor nations are now saying all the right things and in some cases enacting legislation that promises to halt growing debt burdens. Not only Greece and the southern European peripherals, but France, the U.K., Japan, and even the U.S. are sounding alarms that might eventually move them towards less imbalanced budgets and lower deficits as a percentage of GDP. Still, credit and equity market vigilantes are wondering if in many cases sovereigns haven’t already gone too far and that the only way out might be via default or the more politely used phrase of “restructuring.” At the now restrictive yields of LIBOR+ 300-350 basis points being imposed by the EU and the IMF alike, there is no reasonable scenario which would allow Greece to “grow” its way out of its sixteen tons. Fiscal tightening, while conservative in intent, leads to lower and lower growth in the short run. Tougher sovereign budgets produce government worker layoffs, pay cuts, reduced pension benefits and a drag on consumption and the ability of the private sector to accept an attempted hand-off from fiscal authorities. Recession becomes the fait accompli, and the deficit/GDP ratio moves ever higher because of skyrocketing risk premiums and a plunging GDP denominator. In many cases therefore, it may not be possible for a country to escape a debt crisis by reducing deficits! Several months ago I rhetorically asked whether it was possible to get out of debt crisis by increasing debt. Yes – was the answer, but it was a qualified yes. Given that initial conditions were favorable – relative low debt as a % of GDP, with the ability to produce low/negative short-term policy rates and constructively direct fiscal deficit spending towards growth positive investments – a country could escape a debt deflation by creating more debt. But those countries are few – the U.S. among perhaps a handful that have that privilege, and investors, including PIMCO, have strong doubts about U.S. fiscal deficits leading to strong future growth rates. So the developing predicament is becoming more obvious to Shakespeare’s “lenders and borrowers be.” Fiscal tightening and budget conservatism may have come too late for Greece and its global lookalikes. Continued deficit spending may be an exorbitant privilege extended to only a few. Caught in the middle are many developed countries that likely face New Normal growth rates and a continued bumpy journey toward that destination. Gee, I was just about to go and flog the missus to buy some gold but then RB came on here and I feel better now. Fiat cirrencies are going to fall substantially in value even if you don't see it because of competitive devaluation - they are all going down together. Silver and Gold prices tell you this is so. They are now often going up against the stockmarket and very well on any bad news days. Some on here have divided loyalties and it puts them between the horns of a dilemma. If you are an avid fan of a HPC you want to see DEFLATION and the consequential drop in prices a la Japan. 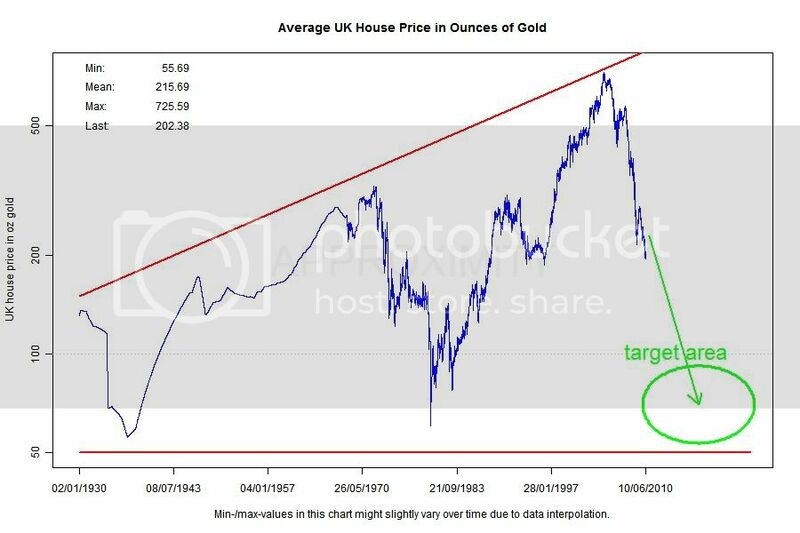 Then, just like a rabbit caught between two stools, some want gold to rise in value which is more likely with inflation which will send house prices soaring again. So its a bit like being a Catch 22 straddling the rock and a hard place, wanting our cake and eat it too. 2. Moon bound gold prices and inflation in house prices along with everything else. In the near future Gold and Silver are once again going to prove to the whole world why they have been 'real' money throughout history! What does Faber recommend? You guessed it...PM's! How about ignoring 'camps' and trying to foresee accurately what will happen whatever it may be. Wouldn't that be more useful? What we want is irrelevant. The only relevant thing is what will actually happen. I want to win the lottery; however what I need to plan for is the 99.99993% chance that I won't. Can someone explain in bit more plain language, how CASH can be dangerous? Physical Gold/Silver is Solvent...Government paper is not! The inflation/deflation debate is just a distraction. Politicians and Central banks are hell bent on avoiding deflation so it's inflation for now. Any serious deflation = currency collapse. Gold does well in either situation. The typical current bank rate on a savings account is 2-3% if you are lucky. The current inflation rate is 3.7% (CPI) and 5.4% (RPI). So essentially you are paying the government 2-3% per annum to look after your cash for you. Possibly more if you think the inflation figures are skewed to the downside like I do. This 'negative interest rate' scenario will likely stay for a decade if you believe Dr Faber as I do. It may get worse where inflation hits say 10% and interest rates are only at 5%. In such a scenario cash and bonds will become trash. They promise to pay you your money back, they dont promise it will be worth anything. In such an environment commodities, stocks and even possibly property will be the place to park your hard earned savings. The UK and Western world has so much debt that printing away and destroying cash and bonds in the mean time will likely be the most politically palatable option.